Again i’ve been overcome with sadness after reliving one of my most favorite characters passing. And this made me think and really believe that the mark of a really incredible writer is one that takes risks. One that is willing to kill some of the most beloved characters in sacrifice to the story….to make it intensely compelling and all together heart wrenching. The deaths all together in the Harry Potter series still makes me slightly emotion when i think about it….Dumbledore, Sirius, Lupin, Tonks, Colin, (forgive me i can’t remember which twin died but sad either way) and even Hedwig. But each one of these really paid off within each book and was the driving force for the final outcome….victory. Which got me to thinking, that in no way does the Twilight series match up with Harry Potter. And let me state already that i do like and enjoyed the Twilight Saga but i still have many issues with it. The main reason way i’m comparing the two is because it seems to be this way in media/general public. But really…what sacrifices were made in Twilight? NONE…No one dies of importance, Nothing ground breaking happens…the story literally ends with everyone happy as clams. Personally, i think this is cowardly writing. there was a good thing going with a love triangle and then quite conveniently it dissolved. And how is it possible to have the biggest build up to a battle to end all battles and the only thing that happens is everyone stands around and talks. i mean really…come on! OK now that i’ve officially broken my dork button i’ll stop my rambling. It’s really just something i thought…and i thought i’d share. Don’t know if you agree but i’d like to know you’re opinion. and if you’ve read all of this…THANKS! and just to make something clear: I <3 harry Potter. 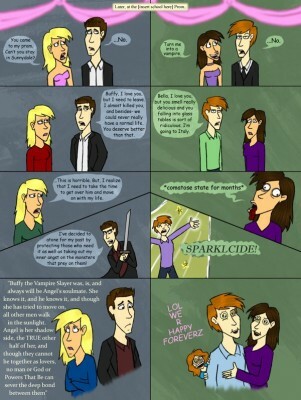 I <3 Buffy….and yes i even <3 Twilight. They just might piss me off sometimes ;D oh and i found someone else that seems to agree with me. Could you message me with a few tips on how you made this blog site look this awesome, I would be thankful. I’m impressed, I must say. Very rarely do I encounter a blog that is both educational and entertaining, and let me tell you, you have hit the nail on the head. Your opinion is important; the matter is something that not a lot of people are speaking intelligently about. I am really happy that I stumbled across this in my search for something relating to this. It’s rare for me to discover something on the web that’s as entertaining and intriguing as what you have got here. Your page is sweet, your graphics are great, and what’s more, you use reference that are relevant to what you are talking about. You’re certainly one in a million, well done! Appreciate this publish OP, nevertheless, I’d extremely a lot appreciate it in case you could embed a relevant video and in addition for some cause when i open this page in Chrome, it looks not the same as while i do it with Opera. Payday loans saves a lot of time if you are applying it online. I’m impressed, I must say. Very seldom do I encounter a blog that’s both educative and entertaining, and let me tell you, you have hit the nail on the head. Your opinion is outstanding; the matter is something that not a lot of people are talking intelligently about. I am really happy that I stumbled across this in my search for something relating to this. It is a surprise how members can avoid an obvious matter like this. I’m impressed, I must say. Very seldom do I discovered a blog that is both educational and entertaining, and let me tell you, you have hit the nail on the head. Your thoughts is outstanding; the issue is something that not enough people are speaking intelligently about. I am very happy that I stumbled across this in my search for something relating to this. It is rare for me to discover something on the net that’s as entertaining and fascinating as what you’ve got here. Your page is sweet, your graphics are outstanding, and what’s more, you use source that are relevant to what you are talking about. You’re definitely one in a million, great job!